When it comes to selecting the type of boiler for your specific hot water application, you are faced with the options of a condensing boiler or a conventional boiler. If you think the decisions end after making this choice, think again! If you do in fact proceed with the more efficient condensing boiler, there is another important decision to be made – what boiler design is best suited for my application? There are numerous articles available comparing boiler designs, however their focus has been geared more towards steam applications using conventional non-condensing boilers. This article will delve into comparing the most commonly used water-tube and fire-tube designs for condensing boilers used in hot water applications and highlighting the advantages and disadvantages of both designs, ensuring that you are well informed to make best possible decision for your application. The first question you might ask is, why a condensing boiler? Condensing boilers are based on a remarkably simple concept. They are a powerful solution to get more energy efficiency out of your hot water heating systems. They also offer the benefit of being more environmentally friendly through the reduction of NOx, COx and other harmful emissions. Condensing boilers achieve higher efficiencies by condensing the water vapor that is produced during combustion and trapped in the flue gases. In conventional boiler technologies, the latent heat contained in the water vapor is allowed to escape through the flue vent. Condensing boilers reclaim that latent heat by condensing the water vapor and transferring its heat back into the return water, which increases boiler efficiency from 80% for conventional boilers (which may be considered exceptional for a conventional non-condensing boiler!) to on average 95% (see Fig. 1). 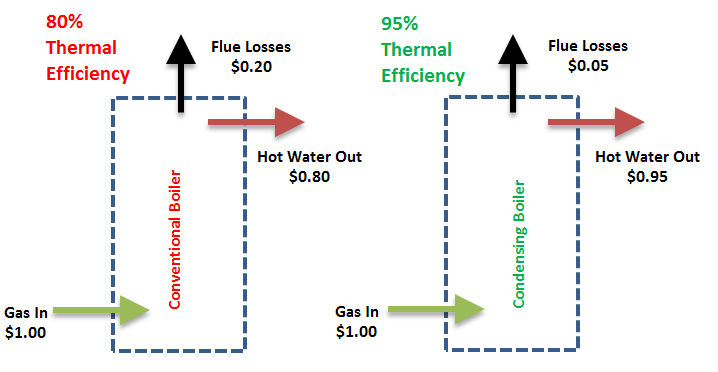 Figure 1: The above diagram illustrates financial benefits achieved by Condensing Boilers over Conventional Boilers. Environmental benefits can also be seen based on the reduction in flue losses. Condensing boilers are on average 40-50% more expensive than conventional types. However, the difference in cost, from conventional to condensing boilers, can be recovered in somewhere between a few months to 4 years (depending on the efficiency of the original boiler installation, boiler utilisation patterns, costs associated with the new boiler installation, and how frequently the system is used) through lower and more efficient fuel use. It should also be noted that the cost of these condensing boilers is dropping noticeably as various incentive programs in several countries take effect while manufacturers withdraw older, less efficient models. However, after the initial cost recovery period, the financial gains are quite significant throughout the life of the boiler and such gains cannot be ignored. In general, condensing boilers are identified by their internal construction as either fire-tube or water-tube boiler designs, as illustrated in Fig. 2 below. A fire-tube, as the name suggests, has the hot flue gases from the combustion chamber, passing through the tubes and out the boiler vent. These tubes are surrounded by a water jacket. The heat from the hot gases transfers through the walls of the tubes and heats the water. In a water-tube boiler, the water is in the tubes while the fire is external to the tubes. The hot flue gases pass around and between the tubes, heating the water and then out the boiler vent. Let’s look closely at these designs in the case of condensing boilers, to have a better understanding of their operation. It should be noted that the design of each individual water-tube and fire-tube condensing boiler also has countless variations and arrangements in order to increase efficiency, response time, capacity just to name a few parameters important to the boiler performance. The main difference between the two designs is an obvious one; they are complete opposites in terms of the location of the water relative to the hot gases. Therefore the direction of heat transfer will differ in each design (as shown in Fig. 3), where we will eventually see, can have a direct impact on the boiler performance. Water-tube boilers are inherently more efficient in terms of heat transfer. The major factor that determines the heat transferred is the heat transfer coefficient. The heat transfer depends on the characteristics of the flow pattern of the fluid, its thermophysical properties, the geometry of the flow passage, and surface conditions. The thermophysical properties that determine heat transfer are the fluid density, thermal conductivity, kinematic viscosity, and specific heat. In the case of flow through the water tubes, the velocity and density of the fluid are the more important properties (based on the heat transfer coefficient’s relationship with the Nusselt number as shown in Eqns. 1-3 below). Where NuD is the Nusselt number, hd is the heat transfer coefficient, D is the diameter of the tube, and k is the thermal conductivity of the tube material. The Reynolds number is given by the relationship between the fluid velocity (U), fluid density, tube diameter (D), and the kinematic viscosity (µ). In water-tube boilers, the fluid with the higher density flows through the tubes and the fluid of lower density flows through a larger diameter external to the tubes (combustion chamber), ultimately resulting in water-tube boilers having higher overall heat transfer coefficient when compared to a fire-tube condensing boiler of the same size and material. Manufacturers have designed methods around this inherent shortfall affecting fire-tube boilers by increasing the size of the combustion chamber (increasing the surface area of the fire-tubes – adding more tubes, adding smaller tubes, and also adding more tube passes) relative to the water jacket around the fire-tubes. These design changes have resulted in a marked improvement in heat transfer efficiency of the fire-tube boilers. Another outcome from this is that the overall footprint (boiler size) of the fire-tube boilers will be smaller in comparison to the water-tube boilers only in the lower capacities up to about 4,000,000 BTU/hr. To economically manufacture a condensing boiler’s heat exchanger and for the boilers to be manageable at installation (time and cost), the smallest practical size for its output capacity is preferred. As shown in the previous section, fire-tube boilers have a smaller footprint when compared to a water-tube boiler of the same capacity. However, this is only noticeable at lower boiler capacities. In order to increase the boiler capacity, the fire-tube boilers will eventually have to increase the volume of the water jacket, whereas water-tube boilers simply have to increase the surface area of the water tubes by either increasing the number of tubes or passes. With an increase in the water jacket volume for the fire-tube boilers, there is an unfortunate trade-off with the heat transfer efficiency and also response time (due to the large volume of water requiring heat). This is one of the reasons why the majority of the high capacity (> 4,000,000 BTU/hr) condensing boilers on the market today are in fact water-tube boilers. Another characteristic that has been often overlooked is the weight of the boilers. At these high capacities, not only would the boiler size be an issue, but also the weight would come into effect. Given the increased volumes of water being contained in the fire-tube boilers, there is also an increase in the weight of the unit. Water-tube boilers weigh significantly less than fire-tube boilers at a higher capacity. This should be important to note because if the boiler is to be lifted to higher elevations, the crane requirements will be different based on the design selected. Other factors will also have to be considered which may include structural requirements and additional permits just to name a few, ultimately driving up the installation time and cost. Water-tube boilers are known to be safer than their fire-tube counterparts from an operational standpoint. The feature that makes water-tube boilers so much safer is the volume of water contained. In a water-tube boiler, it contains a minimal amount of water at any given time. It may be just one-tenth the volume of a fire tube boiler, which requires a larger volume of water to act as a heat shield so that metal in the boiler doesn’t melt and create problems. When fire tube boilers run low on water, the metal in the boilers shrinks. In such an instance, if cold water is sent into the boiler, the metal could quickly expand, causing an explosion. However, with less water present in a water tube boiler, if anything goes wrong, the explosion won’t be anywhere near as serious as it would be in a fire tube boiler. The water-tube boiler may just result in a tube leak, which can be easily contained. Water-tube and fire-tube boilers are complete opposites in terms of the location of the water relative to the hot gases resulting in water-tubes boilers being inherently more efficient in terms of the heat transfer. Manufacturers of fire-tube condensing boilers have developed various methods to overcome this inherent shortfall, where the heat transfer efficiencies are similar for both designs. At low output capacities, fire-tube condensing boilers have a smaller footprint when compared to a water-boiler of the same capacity. It should be noted that the boiler performances can be similar regardless of whether using a water-tube or fire-tube, where efficiencies of up to 95% can be achieved, depending on the manufacturer and configuration. However, at higher capacities, water-tube boilers may outperform their fire-tube counterpart in terms of efficiency and response time. Also, at these higher capacities, the size and weight of the fire-tube boilers may significantly increase compared to the water-tube design. Most importantly, water-tube boilers are inherently safer in operation than their fire-tube counterparts where a serious problem may result in an explosion of the fire-tubes boiler; while the water-tube boiler may result in a tube leak. There is no perfect condensing boiler design in the world, if there was one, we would only be manufacturing and marketing only that one design. It is therefore important to have an understanding of the different types of condensing boilers and how each design may be beneficial to meet the requirements of your system. Richard C. Dorf, “The Engineering Handbook,” CRC Press LLC, Boca Raton, 2000. Samuel C. Sugarman, “HVAC Fundamentals,” The Fairmont Press Inc., 2005. Georgia S.A. Parker J. Blanchard, “Condensing Boiler Assessment: Peachtree Summit Federal Building Atlanta,” Prepared for the General Services Administration By the Pacific Northwest National Laboratory, Nov. 2012. General Services Administration Public Buildings Service, “CONDENSING BOILERS GPG-004,” Updated June 2014. Housing Energy Efficiency Best Practice Programme Documents, “Domestic Condensing Boilers – ‘The Benefits and the Myths’,” General Information Leaflet 74.